Eat First, Think Later. : Mini cheesy cupcake @ The Loaf, Pavilion KL. Mini cheesy cupcake @ The Loaf, Pavilion KL. Ever been to the bakery shop named The Loaf at Pavilion KL? which is known that it was opened by our PM's daughter. 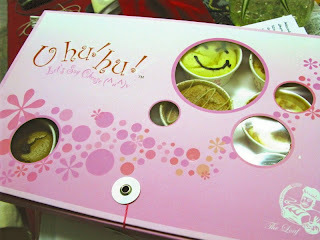 Anyway, I passed by this bakery shop yesterday evening and found something NEW they were selling! They called "U hu hu! Let's say cheese (^u^)v". It's cheese cupcake! Not like the usual cupcake/muffin we usually see selling in the bakery store. this is just like cheesecake, in a cup! Alright, let me tell you about how good it is. Definitely "Highly" recommended by me. Better go try it now before quality turns bad (which I never had faith in KL's food quality maintenance). It's been a very long time since I last had cakes that satisfy me. I'm bored of hotel cakes and cakes that are sold in starbucks and coffee bean. Now this is slightly different, in spite of the cake in the cup thingy... which is something new here. The taste and texture is heavenly. It has a very smooth and soft texture, it's like the texture between a very soft sponge cake combined with cheese. Not too sweet, just nice (for me). Aroma is not bad too. Go and give it a try. Dessert lovers will absolutely like it! I haven't tried all their flavors yet. But I tasted some that I can give comment about. Caramelised Heartiness - First time when I taste it. I was in heaven~ the cheese and caramel taste goes along pretty well, neither one of it tasted too heavy. There's also a very soft biscuit/crust at the bottom, very moisture and aromatic as well. Should really try this! Luxurious Chocolate - This is recommended by the shop keeper. 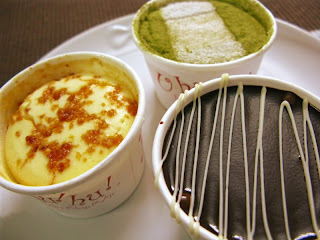 To me, it's recommended to dessert lovers who like it less sweet. The chocolate is semi-sweet, which is just one layer one top of the cheese cake. 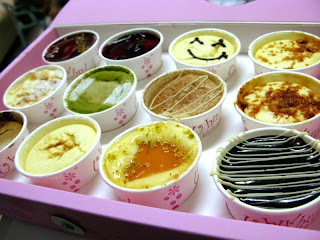 Inside, it's plain cheese cake with the soft moisture biscuit bottom. Nothing to shout about if you're bored with chocolate flavor. Amelia : Woo-Hoo! your very first respond to my blog! ^^ Hmm.. I think it's neither cheap nor expensive. starbuck/coffee bean cheesecake is selling @ rm 8++. Actually is about half a portion of 1 slice of cake. Not that expensive right? the best way to KL is always the LRT man.. Haha! and yea.. talking about the jam. if you're not familiar with the road there, best not to drive. Steph: Actually, when you put it that way, it's quite reasonable.. X) Bet starbuck's side stuffs can't beat it neway, when I think about it. Thank goodness I have a brand new GPS. Hahaha. Oooh I saved the route to the girl's house too!!! Tim : eh.. since u have a GPS. going to pavilion aint that hard wut.. I saw the smiley face b4! !